The Medicare Shared Savings Program (MSSP) has produced small but significant improvements in mammography utilization in its first three years, according to a new study published online, September 20, in the journal Radiology. 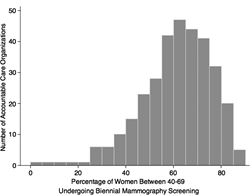 Screening mammography is associated with having access to the health care system. Women start getting screening mammograms and a wide variety of other preventive health services when they start seeing primary care doctors. The Medicare Shared Savings Program (MSSP) has produced small but significant improvements in mammography utilization in its first three years, according to a new study published online in the journal Radiology. “Pay-for-performance incentives in ACOs can facilitate collaboration amongst various stakeholders across the healthcare continuum to improve mammography screening utilization and other key population health metrics, results which will become increasingly relevant as imaging reimbursements transition from fee-for-service to alternative or value-based payment,” Dr. Narayan said. “Impact of Medicare Shared Savings Program Accountable Care Organizations on Screening Mammography: A Retrospective Cohort Study.” Collaborating with Dr. Narayan were Susan C. Harvey, M.D., and Daniel J. Durand, M.D.